Joining the functions of audio converter, audio extractor, CD ripper and CD burner, MediAvatar Audio Converter Pro provides music fans with the best audio conversion solutions to convert audio files among different audio formats (MP3, WMA, WAV, AAC, FLAC, OGG, APE), extract audio from video files in nearly all HD and SD formats, rip CDs to music files and burn music CD from different format audio files. This professional audio converter allows you to apply audio effects (fade-in, fade-out, volume normalize, band pass, chorus, flanger, echo, speed), so you can convert video/audio files or rip CDs to music files with particular effects you favor. And MediAvatar Audio Converter Pro enables you to convert one audio track to multiple files in one go, clip audio segments you love, split audio files, and make more customizations for your audio conversion, CD ripping and CD burning! 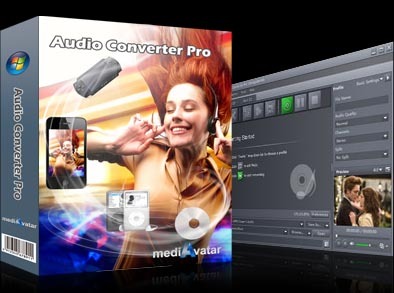 Download mediAvatar Audio Converter Pro for free now. It couldn't be easier! Convert audio files from one format to another with the support for just about any popular audio formats including MP3, WMA, WAV, AAC, FLAC, OGG, APE. Extract CD tracks and convert them into different music format files compatible with different music players. Create audio CD, MP3 CD or WMA CD from your favorite songs in different audio formats. Provides one-stop solution to converting videos/audios/CDs and transferring them to iPod, iPhone and PSP directly. Multi-core CPU processing, multi-threading and batch processing are highly supported, making the converting, ripping and burning processes accelerated and simplified greatly. Includes fade-in, fade-out, volume normalize, band pass, chorus, flanger, echo and speed. Adjust these audio effects to your taste. Set multiple output formats for one input file to output different format files from the same file simultaneously. Clip your favored segments and respectively convert them to any supported audio formats. Choose a preset split mode or customize a split duration/size for a file, then the program will split the file averagely during converting, ripping and burning. Make adjustments to any parameters; edit ID3 tag info of your audio tracks. Ability to auto exit application, shut down, hibernate, stand by system, or do nothing after tasks are complete.